British-born writer Kevin Wignall’s works have been nominated for an Edgar Award, A Barry Award and a CWA Short Story Dagger. Off-topic, but this in turn reminded me of a friend’s daughter reading my young-adult vampire trilogy. The vampire hibernates for long periods and so he’s baffled by the sudden advance in technology, but this reader pointed out to her father that I’d made a mistake, because the vampire was last active in the 1980s, so “he would have known all about the internet”. At that point, I felt about as old as the vampire himself. But to go back to the mobile phone, it sums up an issue that all crime and thriller writers have today, the matter of remaining “current”. Technology has advanced at lightning speed over the last 25 years and it often feels that the world has accelerated with it, a problem when you’re writing books that often have to include the latest technology or refer to the current geopolitical climate. In my first novel, People Die (2001), a character has a film developed in a one-hour photo shop. It’s a nice scene, the incongruous sight of the cold-blooded hitman surrounded by giggling Japanese tourists as he waits for his pictures, but it was almost out of date even before the book was published. In Among the Dead (2002), one character explains to another how you can search for information about people (!) on the internet(!!). At the time, this still would have been news to a lot of readers (Google was only just becoming the default search engine, most people still didn’t have much use for the internet, and it would be another two years before Facebook was launched), but it seems quaint now. Slightly more specialised, in For the Dogs (2004, but republished as The Hunter’s Prayer this year to tie in with the forthcoming film), Lucas advises Ella to turn off her phone. In 2004 that probably would have afforded enough protection from non-government attackers – but if I was writing it today and setting it in the present, Lucas would have told her to throw the phone in the river. But technology increasingly drives current affairs, too, so that can be just as difficult to write about. We’re in a world where apparently stable regimes are swept away in weeks by social-media-driven revolutions, where the nature of warfare and terror changes constantly, where old enemies become allies (as I type, the Russians are talking to the Taliban to see if they can cooperate on stopping IS gaining a foothold in Afghanistan). 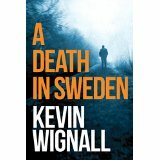 One of these developments was a key inspiration for A Death in Sweden. After 9/11, a lot of private contractors were used by Western governments, sometimes for some very shady work, most notably the activities surrounding extraordinary rendition. But as the wars in Afghanistan and Iraq scaled back, many of these contractors became surplus to requirements. Then Wikileaks happened, a technological lightning bolt to the heart of the intelligence communities, and those former contractors became a potential liability, a smoking gun, if you will. That’s where I got the idea for Dan Hendricks, a man whose specialism is tracking people down and making them disappear into the hands of whichever government is paying. He’s still working, still at the top of his game, but in the post-Wikileaks world, he begins to realise that one of his former employers would now rather ensure his silence – permanently. I thought it had legs, and was still thinking about it when, astonishingly, Edward Snowden stumbled onto the world stage. If anything, that gave even more credence to my plot device, but as a writer, you have to wonder if some other startling development will come along and change everything, perhaps rendering your entire story obsolete in the process. In the end, of course, you have to accept that your work will likely be outdated even before it hits the presses. As a novelist, you simply have to accept that you’re not writing reportage, that your work can never be fully future-proofed. And who knows, people might even enjoy reading about a time when everyone still used dial-up. The real key is to pay attention to what’s going on in the world around you, but never to let it get in the way of character and story, two things which remain timeless. It’s the same reason I very rarely include any details about the guns being used in my books, because it’s not about the gun, it’s about the person using it. So, I mention Wikileaks in passing, but I give you Dan Hendricks, a man whose past is knocking on his door, a man who’s offered a job that might just undermine the people trying to kill him. And I give you Jacques Fillon, a man who dies in a bus crash in northern Sweden, a man who never officially existed, but whose identity Hendricks has to unearth if he’s to save his own life. That’s A Death in Sweden. I hope those of you who read it will love the characters and the story, but if you read it quickly enough it might also still be completely up to date. And for what it’s worth, yes, students did have mobile phones in the early noughties… at least, the one I wrote about did. Jacques Fillon is killed in a bus crash in northern Sweden. His last act is one of selfless heroism, to reach out and save the life of the passenger sitting nearest him. For over ten years, Jacques lived in this quiet rural community, keeping to himself, and only death reveals his secret: Jacques Fillon never existed. Dan Hendricks is a man with a murky past and a shaky future. He's a freelancer, employed to track down fugitives for foreign powers, but a lot of his colleagues have died in the last few months, and it's becoming clear that he could be next. So he jumps at the chance of one more job with his former employer, to find out who Jacques Fillon was and why he disappeared, and perhaps in the process to lift the contract from his own head.